It may surprise you to hear that Takashi Iizuka’s favourite character isn’t, in fact, Sonic. 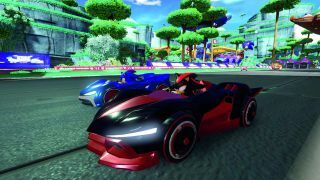 “I’ve always liked Shadow as a character,” the producer of Team Sonic Racing tells us, “but I really wanted him to have a cool car, so we went back and forth with the creative team on the exact stylings of what is in the game now.” In the game, each racer has their own unique kart, with customisation options to fine-tune its performance and appearance. Shadow the Hedgehog is a Speed-class character with a suitably moody-looking motor and a higher top speed than other racers. For those who aren't familiar, Team Sonic Racing offers 4-player offline split-screen action (or 12 players online) with the focus on using teamwork to win, rather than speed; with players sharing power ups and using special moves to help each other out. Iizuka continues, “I witness this sort of thing happening when I watch my son play with his friends, and it sometimes makes the whole game time an unpleasant experience. I wanted to make a racing game where everyone could enjoy playing and winning together, which fed into the idea behind Team Sonic Racing.” It might seem like an odd pairing for a high-speed hedgehog, which Iizuka acknowledges. Let’s face it, you’d expect spiky speedster Sonic to be the winner every time. But Iizuka explains that the kart racer was in fact a step in the right direction when it came to the developers’ vision of uniting gamers around the world online. It made sense to partner again with Sumo Digital, as the developer has a proven track record, having previously made a number of great Sonic & All-Star Racing titles. "We want to continue providing a variety of different games for people to experience"